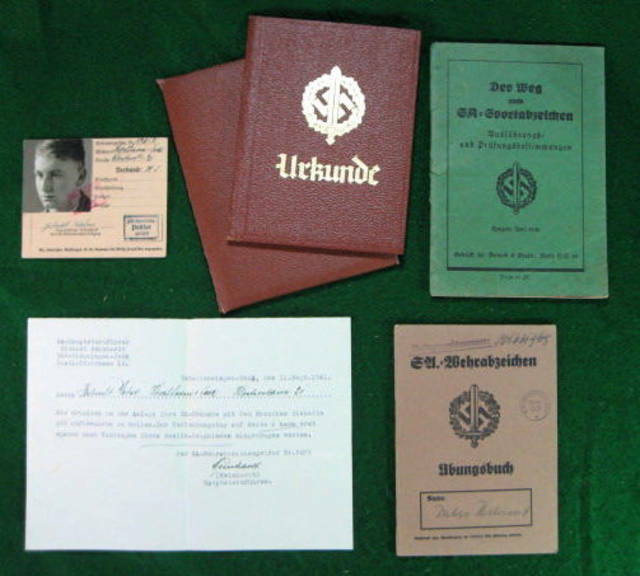 This is an original book from Nazi Germany circa 1930-40's and not a more recent reproduction or replica. This appears to be a rules and regulations book on bicycle riding put out by the Nazi police. The size is approx. 14.5 x 10.4 cm and there are 16 pages. The condition is near very good with no markings, creases, tears, folded, cut or missing pages. Nice sharp corners to the pages. $35.00 PLUS $3.00 USA SHIPPING. TOTAL PRICE IS $38.00 WHICH INCLUDES U.S.A. SHIPPING AND INSURANCE ONLY. INTERNATIONAL PRICE IS US$ 35.00 PLUS SHIPPING CHARGES. FOR INTERNATIONAL SHIPPING PLEASE SEND US AN EMAIL WITH YOUR SHIPPING ADDRESS. USE THE "CONTACT US" FORM ON THE LEFT SIDE OF THIS PAGE. WE WILL THEN SEND YOU A PAYPAL INVOICE FOR THE TOTAL AMOUNT INCLUDING SHIPPING TO YOUR COUNTRY. OR YOU CAN JUST BUY THE ITEM AND PAY THE U.S. PRICE WITH THE U.S. SHIPPING CHARGES AND WE WILL SEND YOU A PAYPAL INVOICE FOR THE EXTRA SHIPPING CHARGES TO SHIP TO YOUR COUNTRY.